Late last year, we said our piece about the failures of the WillCo. GOP as it relates to the Apple "deal." As we consider past failures, however, we can't help spotting opportunity. It's an opportunity they would be well advised to take. Commissioners Court Precinct 1 (Austin/Round Rock/Unincorporated). HD 52 (Round Rock/Hutto/Taylor) -- The old Larry Gonzales seat. HD 136 (Cedar Park) -- The soon-to-be old Tony Dale seat. Each of these races can be won. Each of them should still be Republican. Yet the atrophied WillCo. GOP has recently squandered each. In 2020, the opportunity exists for pro-level playing field/anti-crony capitalism GOP candidates across WillCo. Such candidates should argue that the WillCo GOP's recent forays into crony capitalism have lead to higher taxes and more Democrats getting elected. Given it's immense wealth, the recently proposed Apple 'deal' is the worst example. Crony Capitalism is immoral -- Preferential treatment for the wealthy and politically connected, with the Apple "deal" as the flagrant example, is an inherent abuse of power. Crony Capitalism is bad for the economy -- Having made the abstract moral argument, it's also important to highlight the practical consequence of crony capitalism meaning a net tax increase. Crony Capitalism is awful politics -- Ending the abuse of political power and keeping taxes low ought to be sufficient. But, clearly, it isn't. So let's talk politics. Special treatment for the wealthy and politically connected, along with the higher taxes that naturally ensue, lays the foundation for Democrats. And nowhere is that more obvious, in recent years, than Williamson county. In 2020, the WillCo D's are going to run against Trump. That's perilous territory. But if the WillCo GOP forces the WillCo D's to defend preferential treatment for the wealthy and well connected...they just might remind voters why they rejected the party of Hillary Clinton in the first place. They certainly won't do any worse than they've been doing. 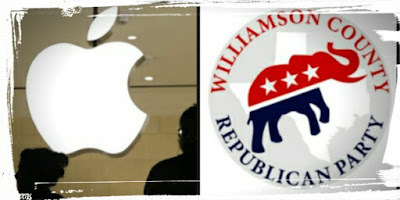 Bottom Line: Williamson County desperately needs an anti-crony capitalism/pro-level playing field insurgency. Open seat primaries are a good platform. This wretched Apple 'deal' is a great place to start.